What is the nature and content of infants’, toddlers’ and young children's inquiries and working theories in relation to their everyday lives in their families, communities and cultures? How might teachers notice, recognise, respond to, record and revisit infants’, toddlers’ and young children's interests, inquiries and working theories in early childhood education? The project explored the nature of children’s interests and inquiries; the kinds of inquiries and working theories that children explore and how these progress over time; teachers' knowledge and understandings in relation to children’s interests, inquiries and working theories and associated curricular decisions and practices, and theoretical understandings of children's inquiries and working theories. There was a particular focus on the links between children’s interests and working theories and activities and events in children’s families, communities and cultures. Little research has been available to guide teachers to adopt analytical practices with regard to interpretation of children’s interests, particularly in multi-cultural settings that represent the diversity of NZ’s population. Further, the counterpart outcome to dispositions in Te Whāriki of working theories has remained somewhat elusive. This is likely to be because little research and few programmes of professional learning have occurred to explore and develop shared understandings of the concept and its importance in children’s thinking and knowledge development. It therefore remains unclear what teachers’ understandings of the construct of working theories are and ways they then recognise, document and utilise these as an element of children’s interests and inquiries in curriculum decision making. 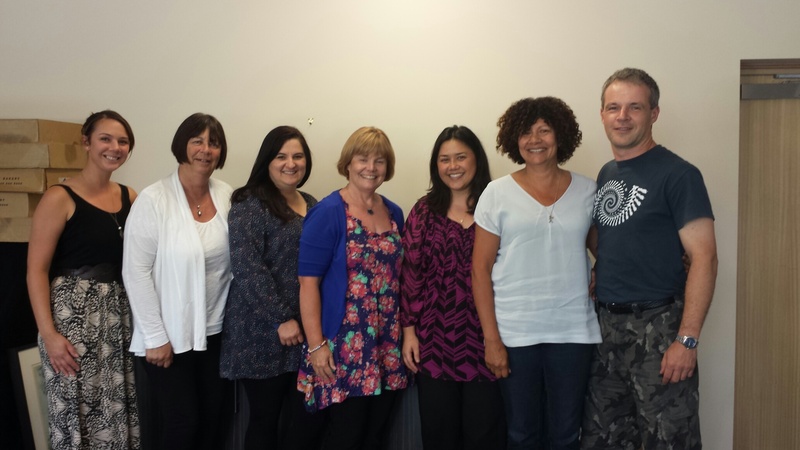 Left to Right: Niky Spanhake (Small Kauri Early Childhood Education Centre), Trish Murphy (Small Kauri Early Childhood Education Centre), Lindy Ashurst (Myers Park KiNZ Early Learning Centre), Helen Hedges (University of Auckland), Maria Cooper (University of Auckland), Bianca Harper (Myers Park KiNZ Early Learning Centre), and Daniel Lovatt (formerly Small Kauri Early Childhood Education Centre). Cooper, M., & Hedges, H. (in preparation). Beyond participation: Addressing collaboration with Pasifika children and their families. To be submitted to Contemporary Issues in Early Childhood. Cooper, M., Hedges, H., Lovatt, D., & Murphy, T. (2013). Responding authentically to Pasifika children’s learning and identity development: Hunter’s interests and funds of knowledge. Early Childhood Folio, 17(1), 6-11. Hedges, H., & Cooper, M. (in preparation). Engaging with holistic curriculum outcomes: Deconstructing “working theories”. To be submitted to International Journal of Early Years Education. Lovatt, D. (2013). Children’s working theories: Invoking disequilibrium. Unpublished M Prof Studies dissertation, University of Auckland. Lovatt, D., & Hedges, H. (accepted). The construct of working theories:Constructivist and sociocultural perspectives. In H. Hedges & V. Podmore (Eds. ),Early Childhood Education: Pedagogy, Professionalism, and Policy. Pearson publication, 2014.
Cooper, M., Hedges, H., Ashurst, L., & Harper, B. (2014). Making meaning: Children’s working theories. Paper presented at Te Tari Puna Ora o Aotearoa/New Zealand Childcare Association conference, Auckland, July 11.
Cooper, M. (2013) Healthy in body: Learning to read infants’ and toddlers’ body language when interpreting interests and inquiries. Seminar and workshop for OMEP Canterbury chapter, Christchurch, September 21.
Cooper, M., Ashurst, L., Harper, B., Lovatt, D., Murphy, T, Spanhake, N., & Hedges, H. (2013). (Re) Igniting home visits in early childhood education: Transforming relationships and curriculum. Paper to be presented at New Zealand Association for Research in Education annual conference, Dunedin, November 28. Hedges, H. (2013). Healthy in mind: Analysing and supporting children’s working theories. Seminar and workshop for OMEP Canterbury chapter, Christchurch, September 21. Hedges, H. (2013). Theory, theories and working theories. Presentation for KidsFirst Kindergartens Education Services Managers and Head Teachers, Christchurch, September 20. Hedges, H. (2013). Holistic curriculum outcomes: Which, why, for whom and to what effect? Presentation and seminar at Australian Catholic University, Melbourne, March 26. Hedges, H., & Cooper, M. (2013). Shaking up the territory: Re-envisioning children’s interests and inquiries. Keynote address to Organisation Mondiale l’Education Prescholaire (OMEP), Canterbury chapter, Christchurch, September 21. Hedges, H., Cooper, M., & Lovatt, D. (2013). Responding authentically to Pasifika children’s learning and identity development: Hunter’s interests and funds of knowledge.Faculty of Education seminar, May 6. Hedges, H., Cooper, M., & Lovatt, D. (2013). Collaborating with Pasifika families to make sense of children’s interests and inquiries. Paper presented at Pasifika Early Childhood Education Conference, Auckland, January 30.
Cooper, M., Hedges, H., Ashurst, L., Harper, B., Lovatt, D., & Murphy, T. (2012). Infants' and toddlers' interests and inquiries: Being attentive to non-verbal communication. The First Years: Nga Tau Tuatahi/New Zealand Journal of Infant and Toddler Education, 14(2), 11-17. Hedges, H. & Jones, S. (2012). Children’s working theories: The neglected sibling of Te Whāriki’s learning outcomes. Early Childhood Folio, 16(1), 34-39.
Cooper, M., Hedges, H., Ashurst, L., Harper, B., Lovatt, D., & Murphy, T. (2012). Infants' and toddlers' interests and inquiries: Being attentive to non-verbal communication. Paper presented at Early Childhood Research hui, Hamilton, November 28. Hedges H., Cooper, M., & Jones, S. (2012). The child as thinker: Children’s working theories. Lecture for Centre for Community Education series, University of Auckland, May 1.